So we’ve all heard that familiar ice cream bar jingle before, ‘œwhat would you dooOoo for aaa Klondike barrr’ right?? Well I’d like to change it up a bit and ask what this Klondike can do for you! Seriously, I am a dutiful little guy, a real ace at hopping around on my two hind legs, sniffing out treats, alerting you when it’s time for a belly rub’¦. all kindsa stuff! 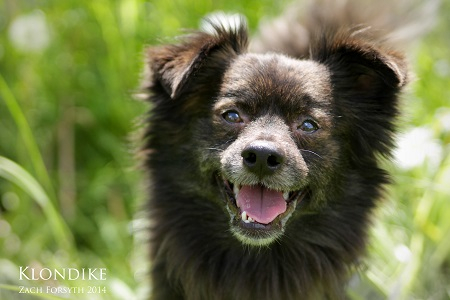 I am a 3 year old, seventeen pound delightful Pomeranian/American Eskimo mix with smoky blue and red brindle in my coat. 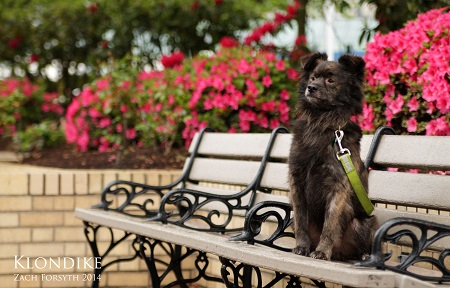 I am good with other dogs so if you have one, I’d love to meet! Or I could be your one and only 🙂 I’d do best without small kids or cats though. So, who wouldn’t want a sweet, cool Klondike around on these glorious summer days?? I come microchipped, neutered, potty and crate trained and current on all vaccines. Fill out an application at pixieproject.org so we can meet! My adoption fee is $250.